[FTC Standard Disclosure] We received no compensation for this post and paid list price for our copy of the book. Amy Mills has graciously provided the giveaway package. June's BBQ give away is a phenomenal one! 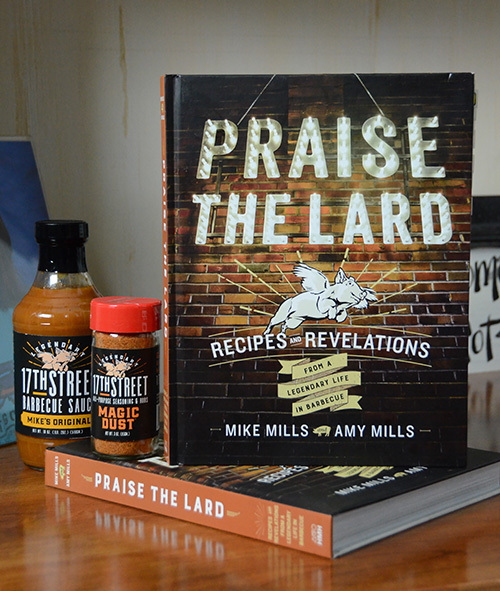 I am giving away a great BBQ/Grilling package from the father/daughter duo - Mike "The Legend" Mills and Amy Mills. They own/operate 17th Street Barbecue, Oncue restaurant consulting, and 3 BBQ World Championships. A 17th Street Barbecue sticker. Praise The Lard is their follow up to the hugely successful and iconic Peace, Love, and Barbecue. I bought my copy as soon as it became available for pre-order but I was just able to flip through it last night. Initial impressions? Wow! I intended to just scan it but ended up enthralled and spent 3+ hours reading sections, marking recipes, and being impressed. I'll do a full review this month but from all appearances, Amy and Mike have nailed this book. Coming from 3 time Memphis in May Champions, you might expect this to be all high-level, uber -pitmaster stuff. It does have advanced techniques but they did an amazing job at writing this as a "how to" book so the newbie griller will not be lost. In fact, I think that if you are a beginning or average griller and cook through this whole book, you will end up gaining the full knowledge and experience needed to be grill master. Praise The Lard will be a greatly appreciated Father's Day gift for Dad. Or if you order it now, it will help you throw a 4th of July BBQ celebration that will be talked about by your guests for years to come. Giveaway entry period begins Wednesday, June 7 and ends Friday, June 16th at 11:59pm. Drawing will be held on Saturday around noon (All times are Eastern Time zone). To ENTER: Leave a comment below. If using an anonymous comment option, leave me a way to get back to you (email, Egghead or BBQ Brethren user forum name, etc). For a bonus second entry, you can tweet or post a Facebook entry about this and post a link to that entry in a comment below. Limited to residents of the continental US unless you want to pay the additional shipping charges. 17th Street Barbecue, Mike Mills and Amy Mills are just sponsoring this prize package. They are not responsible for the drawing or the giveaway. NOTE: Comment moderation is turned on to fight the bots, so your comment won't appear right away. I will shoot you an instant message on the BGE forum to get your mailing address and contact info.